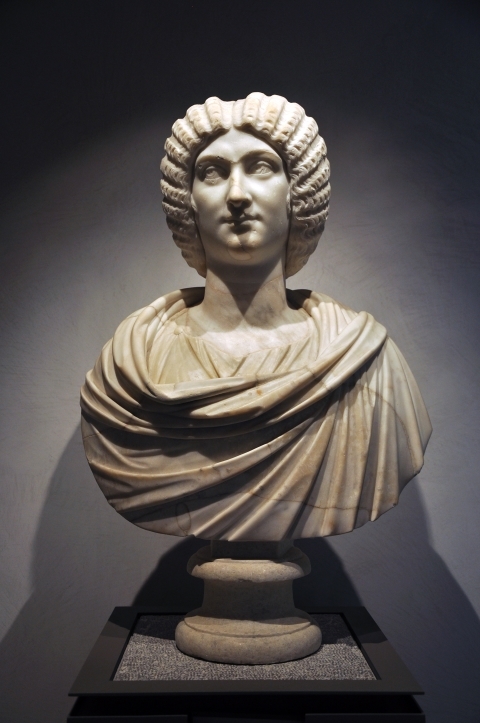 In 2001, Janet Stephens, a Baltimore hairdresser, caught sight of a bust of Roman empress Julia Domna at the Walters Art Museum (the image above is of a bust in the Louvre). Captivated by the philosopher empress’s hairdo, she thought “holy cow, that is so cool… like a loaf of bread sitting on her head.” Thus began Stephens’ quest to recreate the coiffures of ladies of antiquity. In 2005, she had a breakthrough. Studying translations of Roman literature, Ms. Stephens says, she realized the Latin term "acus" was probably being misunderstood in the context of hairdressing. Acus has several meanings including a "single-prong hairpin" or "needle and thread," she says. Translators generally went with "hairpin." The single-prong pins couldn't have held the intricate styles in place. But a needle and thread could. It backed up her hair hypothesis. See Stephens at work and hear WSJ reporter Abigail Pesta tell the story in the video below. I read Kottke too, but thanks for playing! ^ I have no idea what this means. Emily, I imagine more than one person reads The Wall Street Journal. Enough with the pointless snark. PS If we discover an idea from another site, we “via” left and right. Stick around and you’ll discover that.